A lot of foods that are safe to eat when you're not pregnant can harm you or your developing baby when you are pregnant. If you're like most women, you often find yourself wondering whether the foods you loved before pregnancy are still safe to eat now that you're expecting. Sherbet is an example of a food that is OK to eat in small amounts. Sherbet is like a cross between sorbet and ice cream. 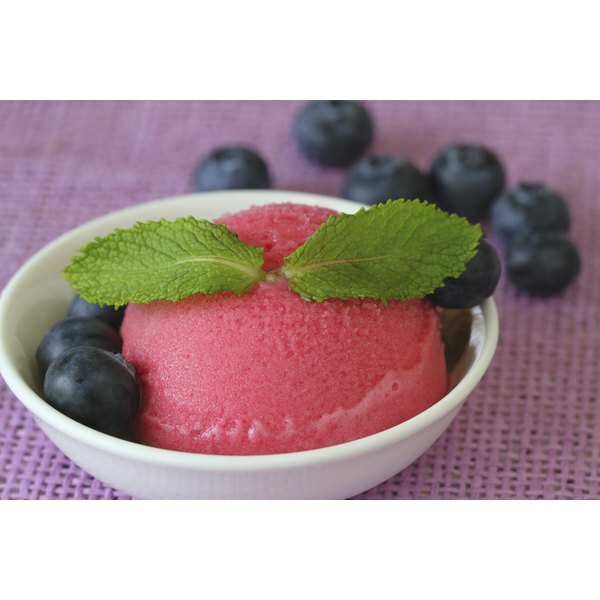 Sorbets typically contain fruit and sugar but no dairy. Ice cream is dairy-based and generally contains significant quantities of both milk and cream. Most sherbet is fruit-based but contains some milk. Sherbets might be sweetened with natural sugar, corn syrup, high-fructose corn syrup or artificial sweeteners. They also might contain natural fruits or artificial fruit flavor. During pregnancy, one of your foremost concerns is making sure you don't take in substances or bacteria that could cross the placenta and harm your developing baby. For this reason, explains Dr. Miriam Stoppard in her book "Conception, Pregnancy and Birth," you need to avoid many normally safe food items, such as soft cheese made with unpasteurized milk. Sherbet, however, isn't one of the dairy products sometimes made with unpasteurized milk. As such, you don't need to avoid it for reasons of potential bacterial contamination. Another major concern during pregnancy is that you need to make sure you're getting the vitamins and minerals you need without overconsuming calories, which can lead to excess weight gain and potential pregnancy complications. Drs. Michael Roizen and Mehmet Oz, in their book "You: Having A Baby," recommend that your pregnancy diet consist mostly of high-nutrient, lower-calorie foods without added sugars and fats. Sherbet is typically low in fat but has large quantities of sugar, which makes it best as only an occasional treat during pregnancy. The source of sweetness in some sherbets is plain sugar, while other sherbets contain artificial sweeteners or high-fructose corn syrup. Pregnant or not, it's best to avoid too much high-fructose corn syrup because excess consumption is associated with increased obesity. Also, high-fructose corn syrup can contain mercury contamination, notes a 2009 study published in "Environmental Health" by Dr. R. Dufault and colleagues. You also might want to avoid artificial sweeteners because their long-term effects on developing babies aren't well-known. Overall, there's no reason that sherbet -- particularly if it's made with natural sugar -- can't be an occasional part of a healthy pregnancy diet. In particular, because sherbet is cold and fruit-flavored, it might appeal to you if you have morning sickness in your first trimester. Roizen and Oz note that many women who struggle with nausea are soothed by cool, fruity flavors. Above all, make certain that your weight gain during pregnancy is on track, and rest assured that occasional sherbet can't hurt you. Can You Eat Peaches When Pregnant?